The nights were full of sounds and the thick soothing smell of the jungle. If the moon was out, she wasn’t prying her gaze through the clouds. The rain at the moment was light, dampening my hair and shoulders within a few steps. Looking at darker silhouettes of plants, I listened to hundreds of voices imagining which animals were producing them. A twig breaking made me think of the large brown tarantula I caught a glimpse off a few days before, or maybe it was a fat snake that was carelessly zigzagging through the bush. 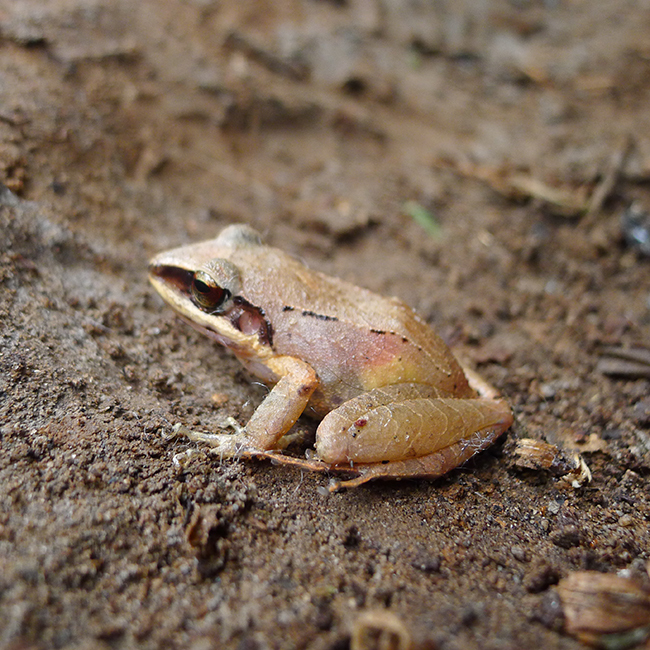 A boastful loud grumbling dominated the conversation coming from a tiny cattle tree frog. If I listened long enough I could hear crackling as some animal’s paws moved up or down the hill, perhaps it was the ocelot whose paw tracks I would almost walk over days later. 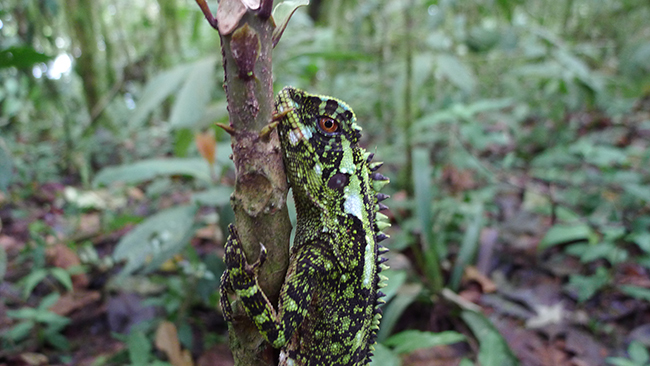 At this point in the story I have been in the Chocó region for three weeks. I had a few spots I would paint in regularly while making special trips seeking out new vistas. In the beginning I respected the ‘no trespassing’ signs. My curiosity though pushed me over to the other side of the barbwire fences and onto the bulgy mounds of clay and grass carved by countless hove marks. Looking around from a high vintage point you could see hills stretching out past your vision, imagining the jungle that use to cover them as it still does in the Poco del Chocó biological reserve. It’s even more mind blowing to think about this back in Toronto now, walking around concreate and pavement where once a forest was. Close to a milking station, where a truck would come every morning to pick up gallons of hand pumped cow juice, was a stretch off land that suddenly dropped off. You noticed it every time you were walking away from the biological reserve because suddenly there were no trees obstructing your view. The first time I crossed the barbwire fence to see what it held I knew I found something special. The second time I took lots of photos with a cell phone camera I had on loan, since my own equipment succumbed to moisture. A week would pass before returning with watercolours. As I was painting using larger swaths of colour, wanting to capture more of an impression of what I was looking at as whole, it suddenly hit me. The landscape was like the flowing river rushing through the valley. It, like the river connected to a point beyond my vision and moved well past it, containing its essence in every section. I looked at my painting and saw it as something like a photograph in a time-lapse of a movement which traces back into millennia while moving forward, a reality in process. With the valley stretching out in front of me I saw the streams of growth bulging in the landscaped, scars covered in different, newer foliage. The view contained many different examples of processes or flows…and then I remembered a phrase I came across in Liquid Modernity by Zygmund Bauman over a year before: space of flows. The term itself was coined by sociologist Manuel Castells and it refers to the global network of connectivity which has created a new relationship between space and time for us to contend with. Global network of connectivity, well nature is that I thought. It all started to fit beautify, this new way of looking at my surroundings. What I was looking at connected to the work I have already done, and the work I have been thinking about getting into. 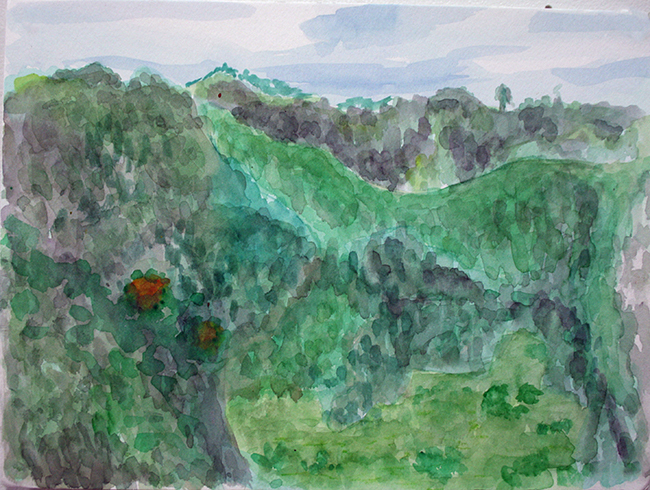 So here I was, looking at the hillside, connecting the things that I have been painting and documenting so far like the landslides, roads, deforestation and preservation, grazing cattle, a piece of garbage in a remote natural area, root system, etc., a natural network of processes. The cicadas were vibrating, sounding like living electricity, and I was smiling. I found the conceptual framework for my work in the idea of nature as a space of flows. The first time I took a ride on the back of the truck we only got half way when the axel dropped dragging 20 meters before we stopped.